Barbara Muir Paints: Super fun -- and still time to get work to you for your Holiday! Super fun -- and still time to get work to you for your Holiday! in front of the wall with my paintings. for her great ceramics, and cool abstract figurative pieces. And for her joyous spirit. gorgeous watercolour work made a beautiful contribution to the show. did very well with our packs of note cards. I want to thank Daniel Anaka for manning the door and helping people find us. spending some time with us, and made the show a success! Gorgeous show!!! So colourful and joyous, your work. With ceramics and jewels, super combination. You look very happy, and very chic. Happy New Year to you & Steven !!!! Wow, looks fantastic. (That center piece is AMAZing! !Love it!) Happy Holidays to you, Barbara! delighted that you like it. You know I love your work! Happy New Year! 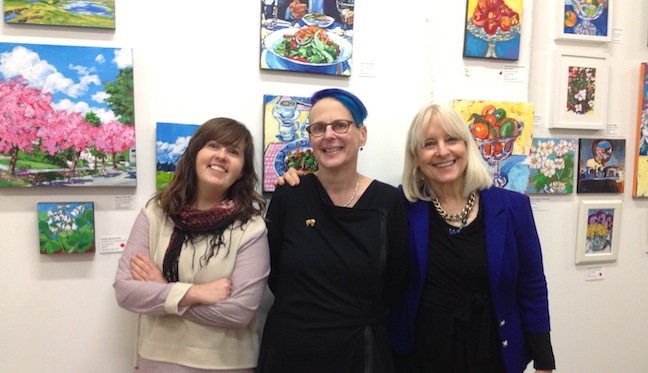 Art Show with Friends -- Great fun! Moving into new colours -- Pink! Dog Love -- I've got it!